While most of today’s authoring solutions (MS-Word, FrameMaker, InDesign) have a built-in capability to render high quality output, this is not the case for a structured authoring solution based on XML. The advantages of separating content from presentation are obvious but require separate output specifications, generally referred to as style sheets. Because these style sheets are part of what is essentially a highly automated publishing system they should be designed, developed and maintained - tasks that should not be underestimated. Obtain high quality output from Sperotech with our high quality and quickly deployable style sheets. Use the style sheet selector below to browse through a choice of common layouts and find a style sheet that closely matches your organization’s look and feel. Note: prices are just an indication. 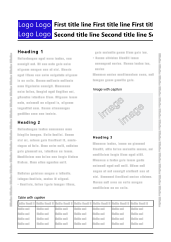 Style sheets will be available by the end of the 2nd quarter of 2010. If you want to be informed of style sheet availability send us an email or even better, create an account and use the style sheet selector to rate the style sheets that would be useful to you. 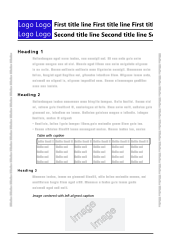 Two column layout style sheet for paged output using XSL:FO as intermediate format. Header, footer, sidebars, and watermark driven by metadata. Fully customizable. Single column layout style sheet for paged output using XSL:FO as intermediate format. Header, footer, sidebars, and watermark driven by metadata. Fully customizable. Each style sheet has been designed to be easily customizable and every part of the style sheet is fully documented. You can change a style sheet by hand or use our style sheet customization application without having to know a style sheet language. Most style sheets have been tested with a variety of processing toolkits and rendering engines. Sperotech develops products that will allow you to implement your single source solution faster. Our resources however are limited. By rating how important a style sheet is for your business you will help us assign the right priorities. You can rate anonymously or you can sign up for an account before you rate a style sheet and we will keep you informed about releases of style sheets you have rated as 'above average'.